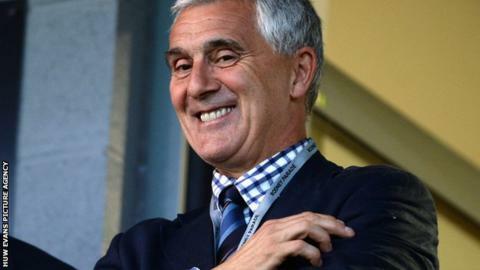 Newport Gwent Dragons chairman Martyn Hazell says they will not stand in the way of Gareth Davies if he decides to stand for Welsh Rugby Union chairman. David Pickering, chairman since 2003, will stand down at the WRU's AGM on 19 October after failing to gain re-election to the board. Dragons chief executive Davies has been tipped as an ideal successor. "It would obviously be an honour for Gareth and it would be the way forward for Welsh rugby," Hazell said. "He'd bring stature to it: he's a very good speaker, he's played rugby at the highest level, he's been on boards at the highest level. He'd be the ideal man for the job. "He's a good ambassador, he'd be a loss to the Dragons - he couldn't do the both jobs - we'd have to appoint somebody else. "We couldn't stand in his way but it will be his decision and the board's decision whether they want him to do that. "I don't know whether he's made his mind up or not, we haven't really discussed it, but we'll see how things pan out over the next couple of weeks I expect." Davies and Llanelli head of rugby Anthony Buchanan both finished ahead of Pickering in a ballot of member clubs for the two available director posts. Former Wales and Lions fly-half Davies has held several high-profile administrative roles for organisations including CBI Wales, BBC Wales, S4C, the Sports Council for Wales, Royal Mail and the Welsh Development Agency.